How did Samurai educate their children? 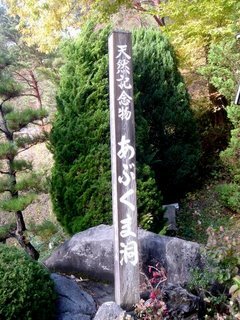 When I visited at Tsuruga Castle in Aizu-Wakamatsu, I found a one of the answers. Because of the castle is a museum now, and we can touch some facts about Samurai's daily life and the history of Tsuruga Castle and so on. At that time, I was really interested in a practice of every child of Samurai. So this time, I would like to write about the practice called Juu-No-Okite that is the rule of the group. The children had to belong their group called Juu when their ages were from six to nine years old for entering their school Nisshin-Kan at their age of ten. So Juu-No-Okite was a rule of the group Juu that were small group of children and they usual played with the group. And every evening, they recited the Juu-No-Okite and had a meeting for reviewing. 1. Don't against what senior are saying. 2. We must make a bow for seniors. 4. Don't act in a mean way. 5. Don't dully to any weak people. 6. Don't eat anything in the outside. 7. Don't talk anything with women in the outside. And we can't do any forbad things. I think the rule includes two important means, first is looking up their seniors and two is helping weak people. Both would affect that they were be great leaders. So, actually the Aizu-Wakamatsu domain was the most famous in valor. Because. Japanese valor should come with consideration for weak people. I guess that it might be ten days ago. 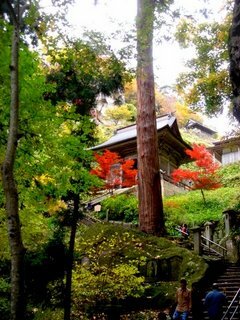 We had excursion for viewing scarlet maple leaves at the famous temple “Jakko-In” in Inuyama-City in North Aichi-prefecture. So, this time, I’d like to upload some of the pictures of scarlet maple leaves and the temple. Inuyama-City is bit famous for tourist attractions, because the city has Japan Monkey Park, Meiji village and Little World, which are theme parks established by Meitetsu-Group. Every park is huge and interesting. 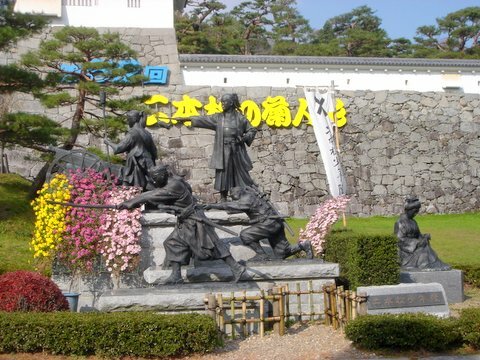 And there is Inuyama Castle that has a castle tower, which is national treasure on the rocky hill close by Kiso River. The temple “Jakko-In” at Inuyama-city is so famous for scarlet maple leaves that there are a lot of posters in Meitetsu stations. This time, I walked on the route that we passed through under Inuyama castle and go to Jakko-In to enjoy scarlet maple leaves, and then we visit the castle and came back with my friends. From here, I would like to upload the pictures! This is the tunnel under Inuyama-Castle. And Kiso River flows right of the picture. 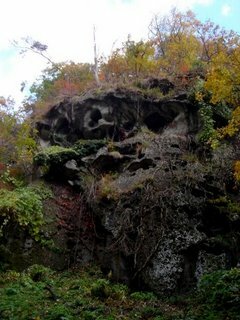 We would guess the area is the upper of Kiso River by the atmosphere of the rock. I took the picture has a lot of scarlet maple leaves on the small brook when I walked to Jakko-In. There’re a lot of leaves. The road to go the temple was colored by a lot of scarlet maple leaves. The timing when I visit was end of the season of scarlet maple leaves. So we walk on the road covered by a lot of fallen leaves. The road is like this picture. The trees are scarlet maple leaves at right side. So, these are the pictures that I took when I found a small path at right side. 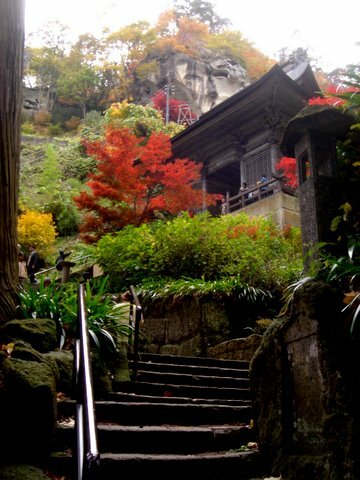 The steps also covered by scarlet maple leaves. I guess that it’s easy to slip at raining day. I took the scarlet maple trees on the steps. So, there are just scarlet maple leaves! There was a bronze statue after the steps. Of cause the background also scarlet maple leaves! After the bronze statue, I guessed that it was the real beginning of the approach to Jakko-In. There were no autumn leaves on the steps, so I took the picture. But, the scarlet maple leaves continued from next steps. We really loved the scarlet maple leaves. Don’t you think it’s beautiful? These steps were under the roof made in scarlet maple leaves! The color was beautiful red at the foot, but the colors were changed to yellow! Because of the scarlet maple leaves are very sensitive in the environment, so there was a difference of temperature between the foot and top of the small mountain that Jakko-In locates on. There is Jakko-In is a temple on the top of the mountain. And it has a special bell. How special? If we pray for our dream while striking the bell, the dream will come true. So, I struck it strongly! I wish the dream would come true. And I took the picture of Inuyama-castle while going back. The left of the sun is Inuyama-castle, and the river is Kiso River. 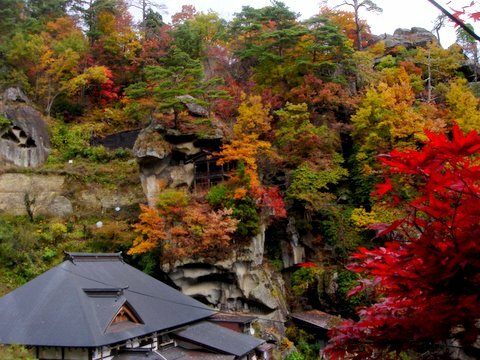 Japanese really love scarlet maple leaves, and the leaves is one of the representatives of Japanese autumn. The atmosphere is difference from Canadian one. Canadian Maple leaves would be great and breathtaking, Japanese Maple leaves would be sensitive and breathtaking. Because, Japanese beauties have been cared from old times and it was calculated. 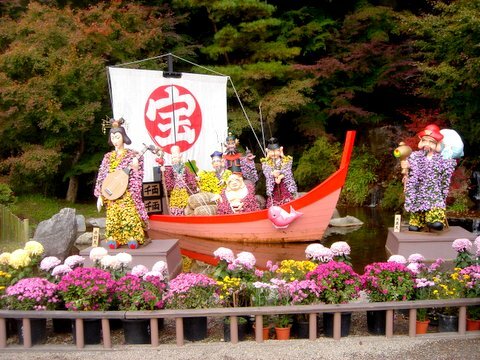 This blog is also written about my travel in Tohoku area. 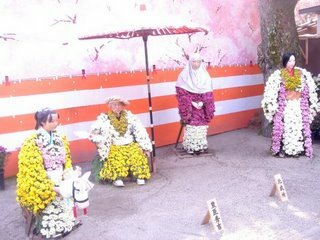 And this time, I would like to write about the event that is The Dolls of Chrysanthemum Festival called "Kiku–Ningyo" at Kasumiga castle in Nihon-Matsu city. When we wanted to enter into the Kasumiga castle, we could found the bronze statues who died at the Boshin-war when they were so young. Generally the bronze statues aren't decorated with flowers, but the date was special. 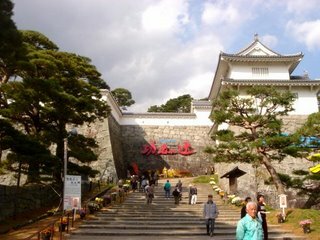 And this is the entrance of the castle, and there is a long stone stairway in front of the gate. Can you find the two dolls on the stairway? They are so small on the picture. We enjoyed a lot of chrysanthemums in the castle. 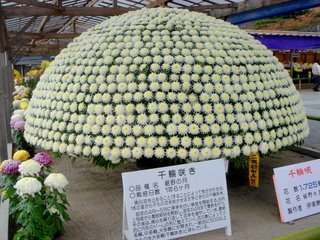 And the chrysanthemums is called "Sen–Rin-Zaki" that means "One thousand chrysanthemums". And the explanation about the chrysanthemums describe that the number is 1725. Wow, it's over one thousand! 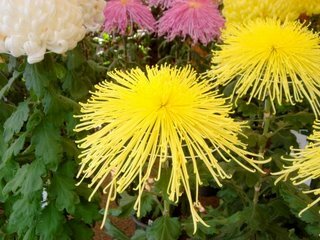 we enjoyed a lot of single chrysanthemums also. And this was my best chrysanthemum at the event. Is it beautiful? But some of the chrysanthemums were already dead, and others didn't start flowering yet. Because, it makes everybody enjoy some of full-blown chrysanthemums over the term. The theme of this year is "Komyoga-Tsuji" that is the famous period drama and the story is the success story of Kazutoyo Yamanouch who was a just soldier when he was young. But finally he became a King. 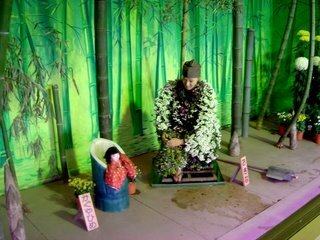 So a lot of the chrysanthemum dolls show some scene in the drama. I can't remember the exact number of the scenes and it might be around 15. So there were a lot of people on the drama in included Kazutoyo. And this scene is Hanami that is cherry-blossom viewing. 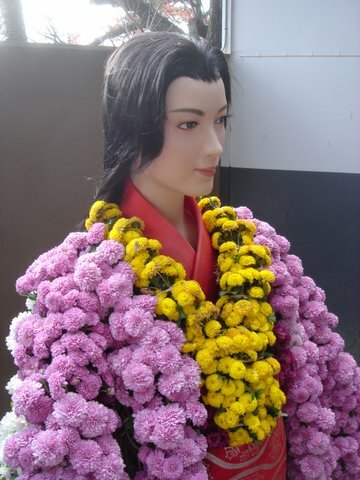 We enjoyed a lot of chrysanthemums all over the event included the drama. 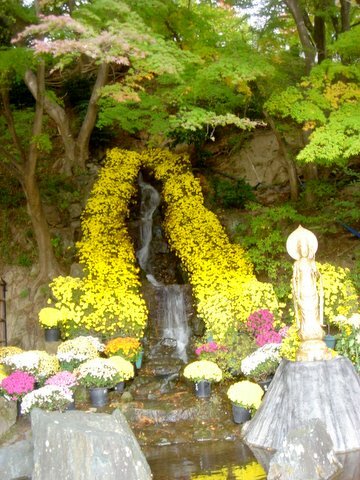 And the waterfall is also dressed with the chrysanthemums. This is the biggest scene of the drama that is Sekigahara-war. 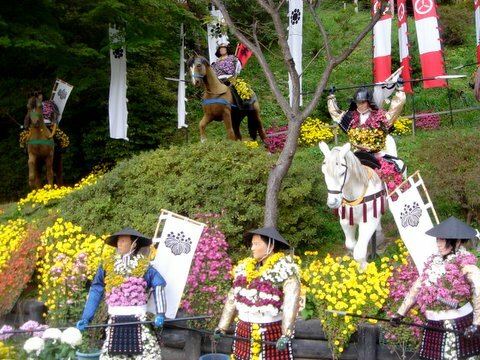 The Samurai on the horse is Kazutoyo. Maybe you can see that the dolls wear the chrysanthemums. After the drama, the atmosphere was changed to Japanese story of olden times. 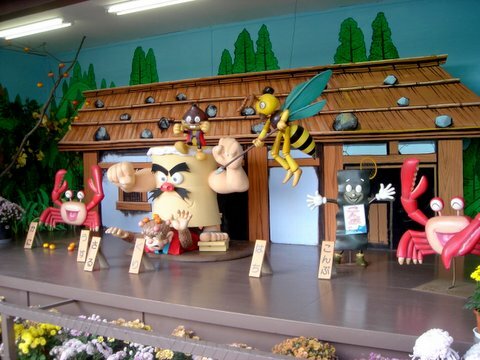 And the picture is "Sichi-Fuku-Jin" that is the Seven Deities of Good Fortune. If we see the picture carefully, we can find the autumn leaves. 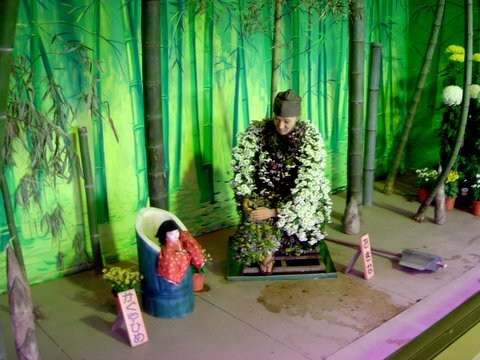 We found the doll that is changing the chrysanthemums and we went near the doll and took the picture. And we found the fact that general people can try the change with our reservation. These pictures are Japanese story of olden times. Someday, I would like to describe the stories. This isn't Japanese story of olden times. 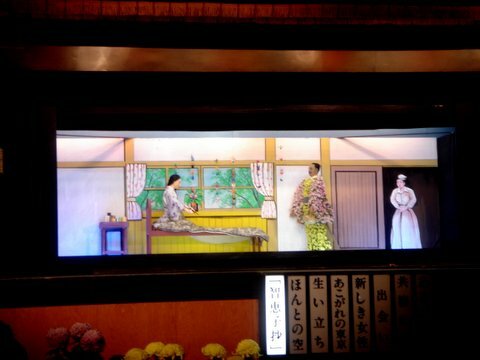 And is a puppet show that describes a woman who fights with her incurable disease and her name is Chieko. 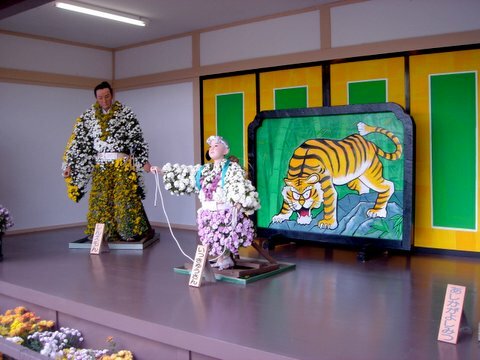 They also wore chrysanthemums. I took the picture on the hill after went out from the event. We could see the whole place of the event. This side is the scene of the Sekigahara-war, can you remember? We enjoyed the chrysanthemum doll festival so much. And the festival is unique for me. When I visited some places in Tohoku area. I found the fact that they really love their local famous people. It's bit difference from other country's one. When I travel at Yama-Dera in Yamagata prefecture, we eat the local dishes, which are Soba and Imo-Ziru. Do you know what kinds of noodles are famous in Japan? Ramen, Udon, and Soba are so popular in Japan. Udon is popular in Weston Japan, Soba is famous at north are popular and ramen is for all over Japan. So at last travel in north are in Japan, it gave an opportunity to eat real Soba to me. The flavor was so nice and it was difference flavor and taste in other area. At first, we ate the Konnyaku and Japanese pickles after our order. Both are special local dishes at the area. Konnyaku has very unique feel in our mouth. 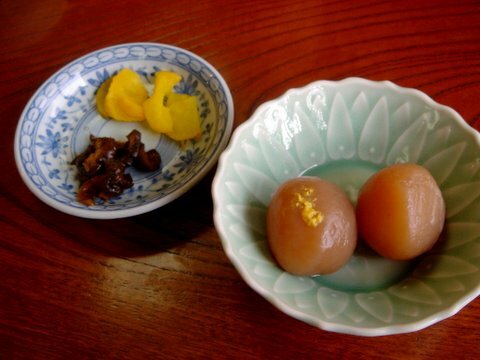 Please try Konnyaku if you have any chances to try it. And we were waiting for our Soba and Imo-Ziru during eating them. This is the Imo-Ziru. 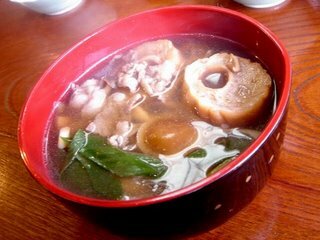 This is a soup with Sukiyaki taste and several kinds of ingredients. 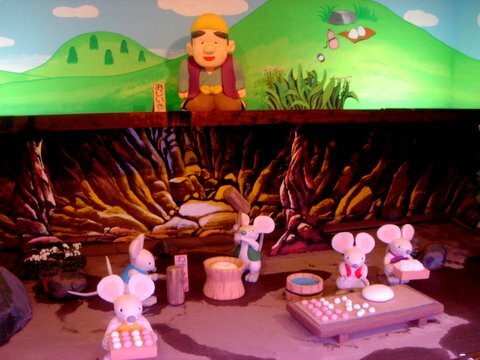 The mean of the word ‘Imo’ is describing potato and taro, at that time we ate some taros in the soup. The most interesting ingredient was Sendai-Fu for me, and is so unique for me also even if I’m Japanese. And this is another main dish Soba! We ate them with cold temperature, the taste was difference from other area’s one. Especially it was a good season for Soba, we enjoyed them very well. 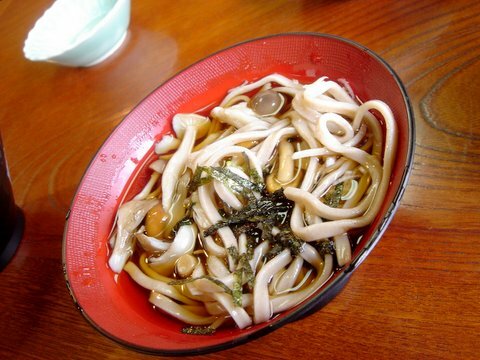 So when you visit Tohoku Area, which is north part of Japan, don’t forget to eat Soba. It’s so nice. 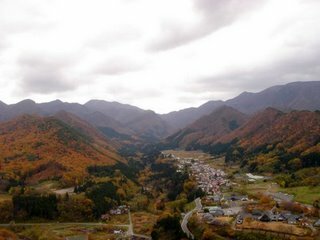 At my traveling in Tohoku area, Yamadera in Yamagata prefecture was one of my important places to visit. Tohoku area has four famous Buddhist temples, and one of them is the Yamadera, So I’ve watched some posters of it at some JR stations. So I ‘m so happy! Because, I got the opportunity to visit the great temple, and I also get the opportunity to upload some my pictures about Yamadera! I hope that my picture will make you visit the temple. There are some reasons that Yamadera is famous, and one of them is Basho Matsuo who is one of the greats about Haiku that is Japanese poem. There is his bronze statue near the souvenir shops the foot of the mountain. Then, if you see the next of the bronze statue, you would find the monument about his poem. The poem describe below means. My last boss sometimes gave me the explanation about this Haiku. 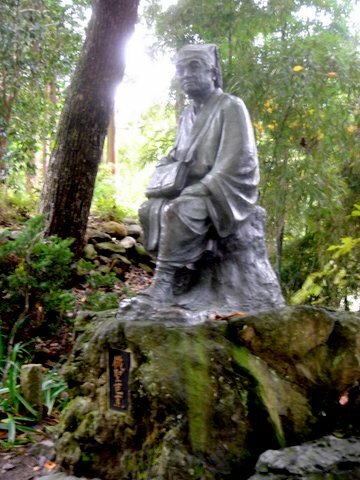 The time he told me that there are a lot of cicadas and they are chirring in chorus in summer, the time Basho found the fact that he can’t hear it. It just likes that the chirring are soaking in the rock. 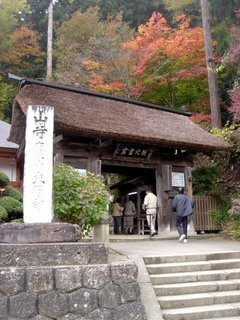 This is the gate of Yamadera. At the gate we need to pay 300 Yen to enter. 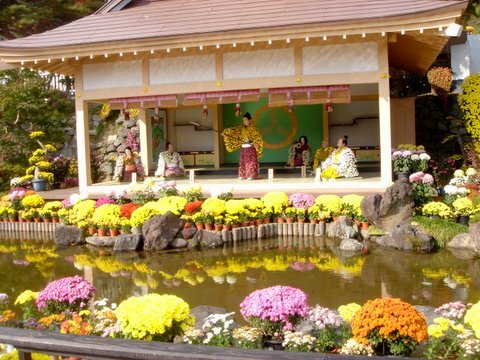 I think it’s so cheap if I compare to the famous temples in Kyoto, and the price is the cheapest. At inside of the temple, we can find some interesting things, and the below is also one of them. Somebody put a lot of coins into in the cracks of the bark of the big tree. Some of senior Japanese believe that big trees have a sprits or god. I guess that they might do it. If I visited there with one of my Chinese friends who really love Ninja, I would say “They are present Shuriken and they are very safety, Because, it isn’t dangerous, is it?” to him. We found some sculptures on the big rock after few minutes ago. 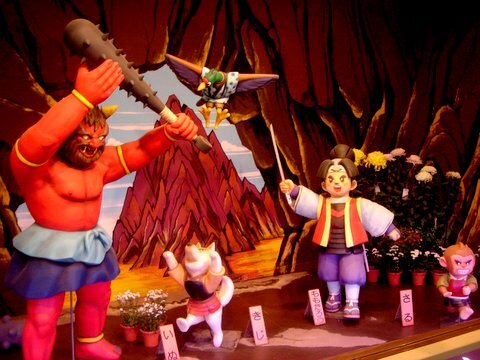 The mountain is a big rock mountain and it has a lot of sculptures and small shrines. The picture is just one of them. Than, if we saw left side, there is a gate. It isn’t the top of the mountain. On the other hands, if we saw right side, there are some small shrines on the rock. 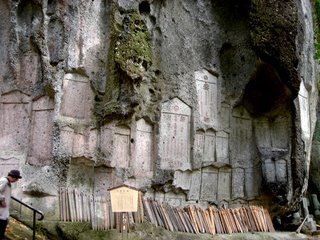 Can you see some stone images of Jizo? 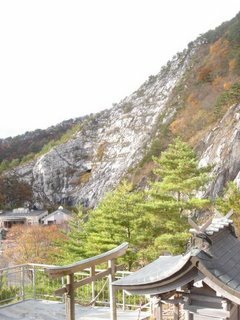 I felt some spirits of the Buddhist monks who leads an ascetic life on the mountain that was the holy mountain for them before. And a lot of monks died here. And this is the picture that I took after the gate. The view is so beautiful by the temple and the rocks and autumn leaves. After few minutes, I took this picture. It was almost the top of the mountain. There are three roads to go the top, to go the foot of the mountain and to go the right side of the picture. There is a monumental image of Buddha at the top, but we couldn’t see it at that time. 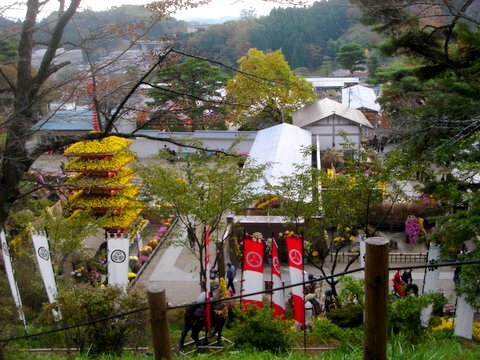 Can you see a lot of the shrines on the picture? At last junction, I went to right road and took this. Of cause we can’t go there, the reason is so dangerous for general people. But autumn leaves are so nice. There is a kind of turret at the end of the road, and we can enjoy the great view on the turret. At that day, I climbed the mountain from the foot, but we didn’t feel tired. I can guess the reason that the mountain is so interesting and we enjoyed convocations during climbing. 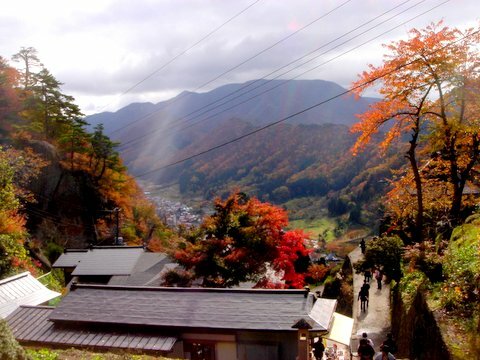 Especially, this season is one of the best to visit there by autumn leaves. On the turret, I took the picture. I think that this picture is so easy to guess the feature of the part of the mountain. Can you guess how the monks lived in the small hut on the right side of the picture? I have no idea. When I went down the mountain, I took it. At this mountain I sometimes felt that maple is the best of autumn leaves. I really love deep red maples, and it adds a good accent for the beautiful view. Finally, I want to describe that my impression of Yamadera. I really want to recommend to visit the temple. 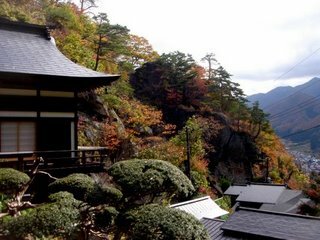 Because, the temple owns a mountain and the site is so vast comparing to some temples in Kyoto. And you might enjoy a lot of refined views. If I say one fault, the temple is so far from some big city in Japan. So it’s better to go there by the cars. This time, I visited there in autumn. I can easily guess that there would be some difference tastes in other seasons, which are summer and winter. Last week, I traveled at Tohoku area. And the provinces were Fukushima, Yamagata and Miyagi. So, I'd like to write about my traveling at Tohoku Area with some pictures often. 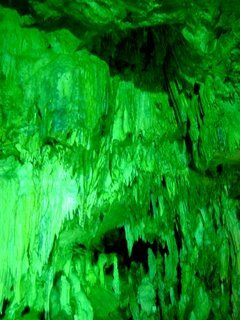 For this reason, I wrote about "The Abukuma-Do", which is one of the most famous and deepest limestone cave in Japan, in Fukushima prefecture at first. Maybe you can guess easily that the limestone cave is far from any stations, so we need to go the limestone cave by the car. So, the transportation isn't convenience for customer, because the cave is surrounded by mountains. However, The Abukuma-Do is so great and I have to recommend visiting there. 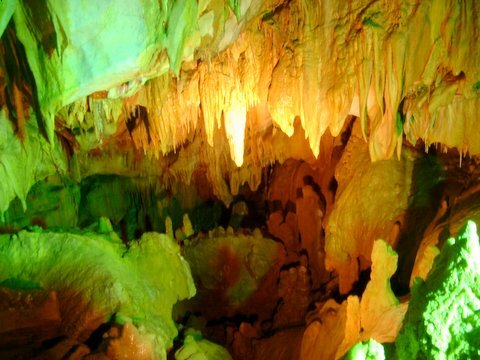 In my case I visited the cave on weekdays, so there are few travelers and not busy. It made me take a lot of beautiful pictures! On the other hands, I think that we can't enjoy the cave well by a lot of travelers at summer vacation or the Golden Week. If you have any chances to travel Fukushima province on weekdays, please go there. It's so nice! From beginning, I have to describe about The Abukuma-Do...... The limestone cave was found in 1916, and then it opened to the public after 4 years, and it received several prizes of Japanese tourist attractions. I can guess that you would have a lot of funs in the cave. The picture is the photograph of the shrine and the surface of the mountain that have The Abukuma-Do. The Abukuma-Do was one of the places mining the limes, so we can see white rocks. 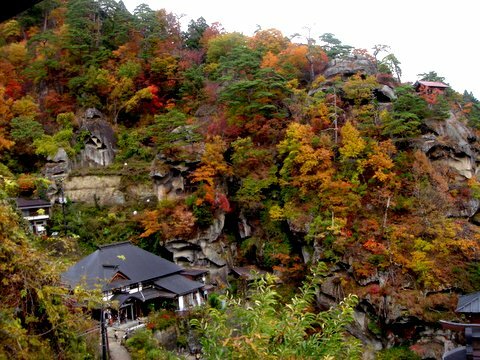 The mountain and water have made The Abukuma-Do for 80 million years. I took a sign of the entrance. 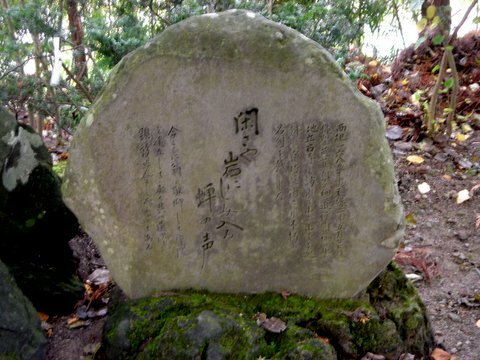 The sign describe that The Abukuma-Do is one of the Japanese natural monuments. When I walked in the Abukuma-Do, I saw some Korean who wanted to scrape off the limestone during walk against the suggested route. I thought that the reason was no sign written in Korean language. It makes some problems for international travelers. Maybe every tourist attractions have to write every sign with several languages to protect. 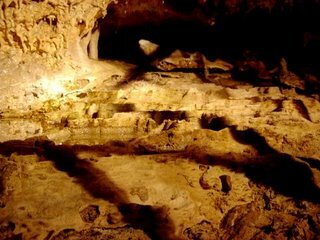 These pictures were taken at inside of the limestone cave. 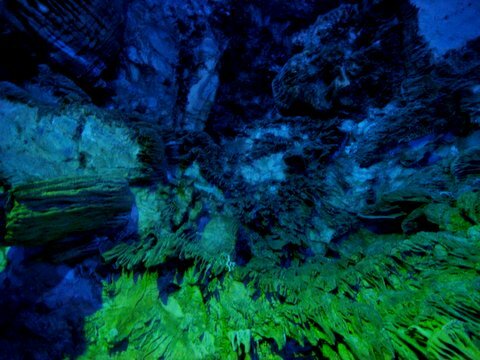 The inside is floodlighted by several colors that are green, yellow, orange and blue and it makes it be fantastic room. This is the roof of the Abukuma-Do. We can see a lot of stalactites. 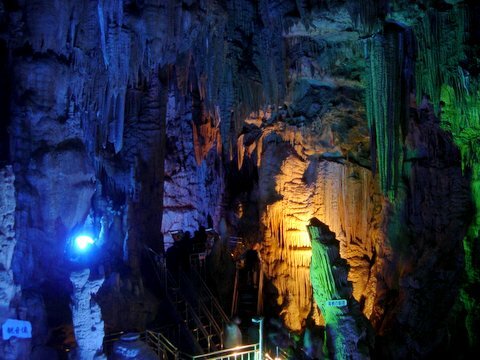 This is the largest room of the limestone cave, and the height is also enough to give strong impressive for us! At the latter half of The Abukuma-Do, there are some table pools of limestone with so clear water. The place of inside is very special and unusual. 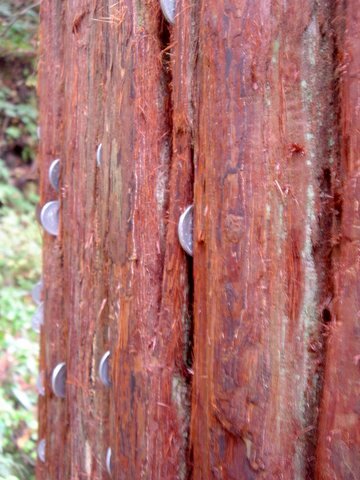 At this opportunity, I chosen the adventure route that is uneven and rough, so sometimes we used some ladders to advance. The route is more expensive than general one, but it's totally nice. So please visit there with your good manners! Because, The Abukuma-Do is so great.